I get a lot of emails about agency self promotions. Curious forays into what creative minds can do when unencumbered by practical concerns, like, for example, selling variable annuities or wedding registries. And, I get a veritable slew of emails (and the occasional ominous paper wrapped mailing cylinder on my porch) from PR agencies working to build buzz about their client’s product or book or thing-a-ma-do. The site is called “Solutions for the Modern American Life”, which they describe as “a collection of high and low tech products, methods and techniques that will help America.” It’s a retro little throwback to the days when the recipes on the back of the Jello box were serious culinary stuff and agency self-promotions were a little more … well, like an episode of Mad Men. And, I don’t think I’m going too far to say – it’s kinda out there. Advergirl: Why did your agency decide to invest in a multimedia self promotion? Gonzalo: In 2005, - closing in on SCPF’s tenth anniversary – the agency made the decision to leap across the ocean into the U.S. market. Since then, we’ve felt the need to explain the ‘newcomer’s’ point of view about the United States and the “American way of life” from a more Spanish and European perspective. Advergirl: Where did the creative idea / concept come from? What was the inspiration? Gonzalo: We wanted to develop a campaign that would speak creative volumes about our agency, our culture and our traditions to the business and creative community here in the U.S. We didn’t want it to seem too self-promotional but reflect how we do business and how we can help bring a different and certainly, fresh perspective to a campaign. Advergirl: What are your goals for the site? Gonzalo: With our first ‘house’ ad campaign, we wanted to continue raising the agency’s profile in this market and to position ourselves as a key creative partner to our clients. We will continue to challenge the mainstream and bring new ideas to the table. Advergirl: We’ve all worked in an agency where the big idea for self promotion hit some bumps along the way. I’m thinking of a certain agency holiday card that everyone was supposed to sing a carol for … except somehow the executives all had an identical whistle in the final rollout. Did you run into any internal challenges / objections during development? 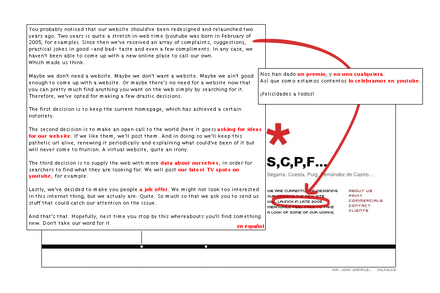 Gonzalo: No, everybody was enthusiastic about this project and promoting SCPF. 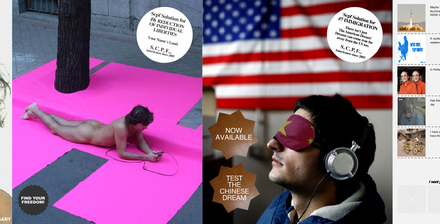 We believe strongly in the power of the creative product - that’s what SCPF has always been about.